This Saturday, rugby fever hits Singapore with the return of Super Rugby at the National Stadium, with Singapore’s adopted home team, HITO-Communications SUNWOLVES facing off against South Africa’s BULLS. 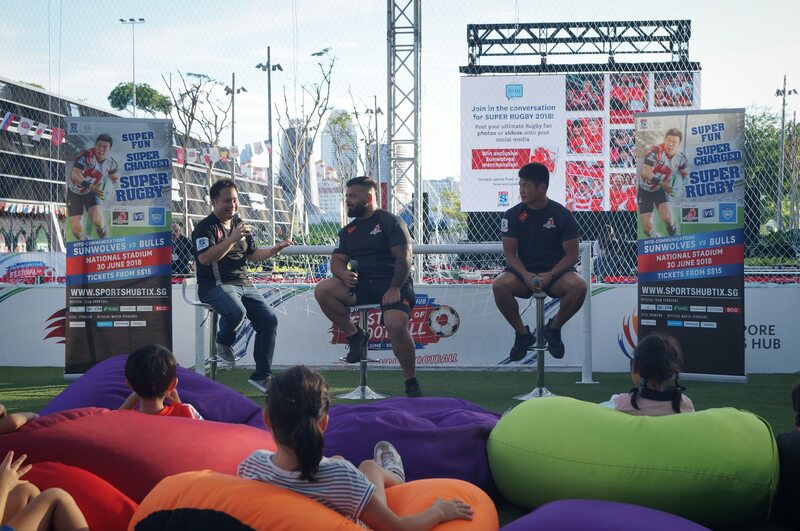 Prior to Saturday’s match, SUNWOLVES team members Nikolaz Khatiashvili (tighthead prop) and Ryuji Noguchi (fullback) were already in town on Thursday as part of the Singapore Sports Hub’s Festival of Football to meet and greet adoring fans, before enjoying the Japan-Columbia World Cup Match which was screened outdoors at OCBC Square. 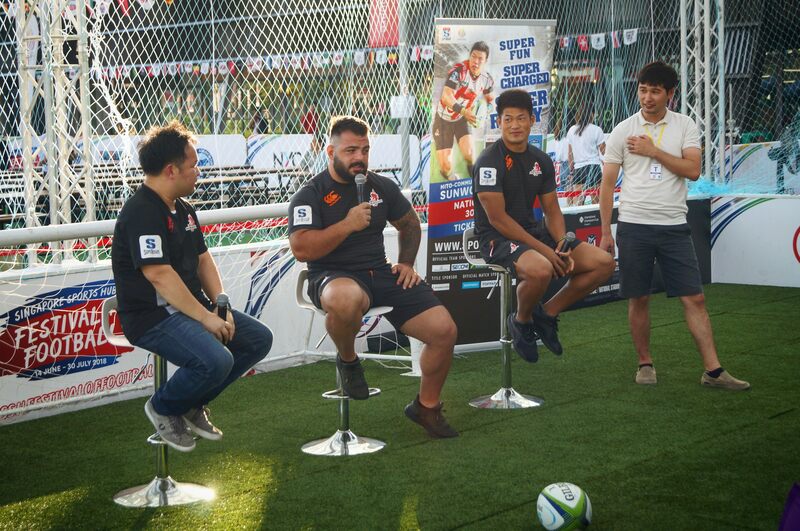 At the meet and greet, Niko and Ryuji took on questions from fans, many of which were young children, explaining more about their hometowns (Georgia and Osaka, Japan respectively), their match preparations, and their excitement at coming ‘home’ to Singapore to play on Saturday. This was also the first time both players are in Singapore. 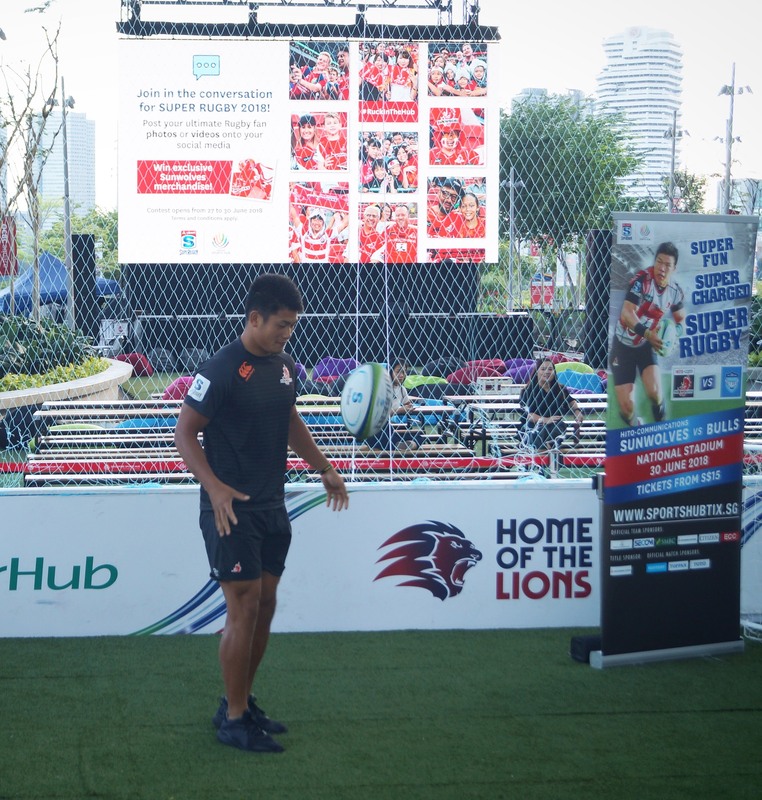 Both players then showed off their skills by juggling a rugby ball in the air with their feet, with Ryuji achieving an impressive 15 counts before the ball touched the ground. 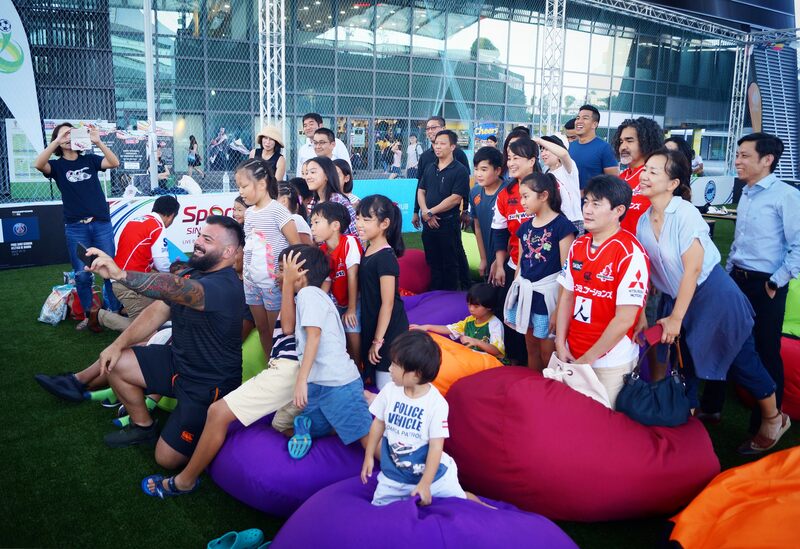 The two players then took a wefie with the fans in attendance, before proceeding with individual photo opportunities, with entire families coming down in SUNWOLVES jerseys in a show of support. The HITO-Communications SUNWOLVES first made their debut in the 2016 Super Rugby season and is the first Asian team in Super Rugby. They are led by former All Black Jamie Joseph as Head Coach, also the Japan National Team Head Coach. The match on Saturday will be preceded by 10-a-side rugby matches by Anglo Chinese School, St. Andrew’s Junior School, and Punggol View Primary School from 5.30pm – 7.30pm, before the match commences at 7.55pm. Having been narrowly defeated by the BULLS back in 2016, with a tiny margin of 27-30, the SUNWOLVES are back stronger than ever before and thirsty for victory. Cheer on Niko, Ryuji and the rest of the SUNWOLVES in the exciting, one night only opportunity to catch them in action this Saturday.